Alaska Whales - Where To See Whales in Alaska during the summer of 2017. Whale Watching in Alaska | Alaska whale watching tours allow the visitors an opportunity to observe and photograph Humpback, Orcas, Gray, and Beluga whales, along with many other marine mammals, in their natural environment. Become proactive in the preservation of Your Alaska. Images, code and text for adding a link to the Alaska whale information pages from your web site. Serendipity - the effect by which one accidentally stumbles upon something fortunate; especially while looking for something entirely unrelated. That's the best description I could come up with to portray the story behind this site. It truly has been “A Whale of an Adventure”. Welcome to Whale Watching in Alaska; if your looking for any of the scheduled whale watching tours along the coastlines of Alaska you will find them listed by region and location. If your looking for more information on Alaska whales, please read through the information below for the complete story about locations, timing and something's related to what you can expect in the form of weather, seas and whale species. Find out when would be the best times are to see the various whales found in Alaska. No vacation to the Alaska Coastal Areas would be complete without taking the time to view and photograph the spectacular sea life found in the nutrient rich waters of Alaska. This is a Mecca of marine life from our beloved whales to the prized wild salmon that thrive in abundance throughout these waters. Whale Watching Alaska has evolved into a information portal dedicated to the preservation of the marine environment. Today information on Alaska whale populations, distributions and over-all health of the various species is being added for your pre-trip reading. We also want to promote environmentally responsible whale watching trips featuring gray whale, orcas (killer whale), humpback whale and the beluga whales. Also being listed for the first time are some of the smaller more intimate cruise lines that offer cruises to Alaska with an emphasis placed on sustainable whale watching. These Small Ship Cruises are best known as Alaska Yacht Charter or Alaska Small Boat Cruise. Most of these tours operate within the Inside Passage. Southeast Alaska Yacht Charters that normally have less then 100 passengers per voyage are based out of Seattle, and Vancouver B.C. Where and When To See Whales In Alaska. Plan on a whale watching tour in the Seward, Whittier, Homer Alaska area. Every spring, Gray whales migrate through the waters off Alaska on their way to their summer feeding grounds in the Bering and Chukchi seas. In the spring, Seward AK Small Ship Cruises include day trips that offer Gray Whale Watching combined with marine life & glacier tours in Kenai Fjords National Park near Seward, AK. These are great combo trips that the whole family is sure to enjoy. During the early spring, you are likely to see the gray whales on their annual migration north to the rich feeding and calving grounds of the arctic ocean. As summer progresses, frequent observations of humpback, minke, and orcas,"killer whales", are present throughout the waters of coastal Alaska. Resurrection Bay in Seward, the many bays off Kodiak AK, Whittier in Prince William Sound, See Map of Prince William Sound, Glacier Bay and Icy Straight, and the Inside Passage around Juneau Alaska. These are some of the hot spots for Alaska whale watching trips. Alaska Whale Watching Tours listed by area. Whale Watching in Alaska ranks at the top in the most popular tours for visitors to the coastal regions of Alaska. Every summer their are dedicated tour boats taking visitors out whale watching in Alaska from Ketchikan to Barrow. While Juneau is the top location for these tours, other cities offer outstanding whale watching in Alaska too. Below are links to pages that list the best tour companies in each area. Check them out and find the tour that's right for you. Southeast Alaska Tours The area known as "The Inside Passage". Includes Craig, Elfin Cove, Glacier Bay, Gustavus, Haines, Hoonah, Hydaburg, Juneau, Ketchikan, Petersburg, Sitka, Skagway and Wrangell. South Central Alaska Tours: Gulf of Alaska, Resurrection Bay, Kachemak Bay and Kodiak Island Tours. Includes the cities of Homer, Seward, Kenai, Kodiak, Valdez and the area of Turnagain Arm. Also see Cook Inlet Beluga Whales for information on the efforts to save this endangered whale. Seward Alaska Gray Whales Info, Trips and Tours in and through the Kenai Fjords National Park out of Resurrection Bay in Seward Alaska. Bering Sea Whales: Areas North of the Alaska Peninsula. Includes the Alaska Peninsula, Aleutian Islands, Bristol Bay, Pribilof Islands and Yukon Kuskokwim Delta. Discover the Inside Passage and Southeast Alaska through one of the listed Alaska Cruise Packages and don't forget to bring your camera along! Depending upon the season there are Gray, Humpback, Orca (Killer whales), porpoises, seals, sea lions, & sea otters just a short boat ride from the dock. Hike the spectacular rainforest trails of Prince of Wales Island, explore the islands during a bear watching Eco tours by boat or vehicle. For bird watchers there are Bald Eagles, Ospreys and Herons just to name a few. Back on shore, enjoy some freshly made dishes from the bounty of the seas around you. This is not just a whale watching tour but a complete Alaskan adventure. Not unlike the Humpback whales that return to Alaska each spring, the Gray whales migrate long distances to the fertile waters Alaska each year. Thousands of Gray whales migrate from their winter grounds in Baja California on their way to their summer feeding and breading areas in the Bering and Chukchi seas of Northern Alaska. Each spring, an estimated 20,000 Gray Whales will travel along the outer coast of Southeast Alaska. If your along the coast of Southeast or South Central Alaska in late March, all of April and well into May, plan on taking a guided whale tour to see this spectacular event. Some of the best places to see Gray Whales in Alaska include Ketchikan in the southern portion of the panhandle, Sitka located on Baranof Island, both Yakutat and Cordova as well as Seward Alaska on the Kenai Peninsula and the island of Kodiak Alaska. Spring whale watching tours are an excellent way to clean out the cobwebs from a long Alaskan winter and kick off the summers excitement with a Seward Alaska Gray Whale Tour in April and May. See the Whales of Alaska: May - September is great for killer whale viewing in Southeast Alaska and June - September is the time to see the humpback whales that return to the Inland Passage of Alaska. If nature viewing is enjoyable to you, consider the Bering Sea Crab Fishing Tour in Ketchikan. It's one of the best hands on tours available with lots of marine life and the bald eagles will be landing so close to you that their size will completely fill the viewfinder of your cameras without the need for a zoom. Great tour for those arriving in Ketchikan on any of the cruise ships during the summer. This tour can be booked through your cruise line, from your travel agent or on the ship from the travel assistant available during the cruise. Glacier Bay is where whale experts first studied humpback whales "bubble-netting" or blowing bubbles to herd small fish into a tight ball before feeding on them. Also prevalent in the Glacier Bay are pods of killer whales, orcas, that patrol the entrance to the bay, while porpoises and dolphins are commonly seen inside the bay. Best time to see whales is from June to early September. What is happening to all the Beluga Whales in Cook Inlet? For years now the numbers of Cook Inlet Beluga whales has been on the decline and even with all the research being conducted, the reasons still remain somewhat of a mystery. From the once 1300 strong, today the population has declined to around 225 whales. Reasons for the decline are still unproven yet it is believed that a combination of events could be a threat to the Cook Inlet Beluga Whale habitat. There could also be other natural or unnatural causes that are attributing to the decline that are yet to be discovered. What they do know is the numbers have become serious and one wrong decision or accidental mishap could mean it's to late. The time has come to get serious about this situation and get the trends reversed. Cook Inlet Critical Habitat for the protection of the beluga whales and benefiting all species of fish and mammals in these endangered waters. Alaska Whales: species that you may see include Beluga Whale, Blue Whale, Bottlenose Whales, Gray Whale, Humpback Whale, Orca (Killer Whale). 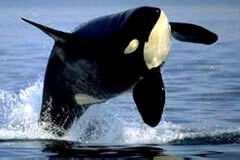 The term whale is ambiguous: it can refer to all mammals in the order of Cetacea (whales, dolphins and porpoises). For the purposes of this web site, Whale will be interpreted as being limited to the larger of the Cetacean order of mammals known to the Alaskan coastline. Also we will be limiting the term Whales to those cetaceans which are neither dolphins nor porpoises. This can lead to some confusion because Orcas ("Killer Whales") and Pilot Whales have "whale" in their name, but for purpose of classification, both are in the dolphins group yet we include the Orcas within the content of this site mainly due to their popularity with whale watching groups of Alaska. NOTE: Pilot Whales are not found in Alaskan waters. When is the best time to see whales in Alaska? What is the best month for whale watching Alaska? The best time for whale watching in Alaska including Juneau and Seward plus Alaska whale watching season and dates is covered in depth. 2017 Alaska Cruises and tours featuring Humpback whales and Orca Whales in Southeast Alaska. 2017 Alaska Whale Watching Tours in Juneau, Alaska. Huge discounts for Alaska Cruise Ship Passengers with discounts on the best whale watching times and dates for 2017.